The announcement of the central leadership of the BJP to go to the Assembly elections in the state under the leadership of former Chief Minister and MP Prem Kumar Dhumal has led to celebrations in Hamirpur. The BJP today finalised the names of candidates for the eight seats. Former chief minister and Lok Sabha MP P.K. Dhumal will contest from Bamsan as the BJP Parliamentary Board has decided to project him as the chief ministerial candidate. The ticket distribution by the Congress has created dissension among the party ticket aspirants in at least two of the five constituencies who are now gearing up to contest as Independents. Even after bidding a tearful farewell to electoral politics, former telecom minister Sukh Ram asserted that he would continue to serve the Congress and ensure its win in the coming Vidhan Sabha election. The discontent brewing among party men in certain constituencies notwithstanding, PCC chief Viplove Thakur today ruled out any changes in the list of candidates announced by the high command. Forest minister Ram Lal, industries minister Kuldeep Kumar and chief whip of the BJP Ravinder Singh were among the 23 candidates who field their nomination papers today. In all eight candidates of the Congress, six of the BJP and two each of the BSP and the CPI, one of the CPM and four Independents field nominations. The announcement of the BJP’s parliamentary board that Hamirpur Lok Sabha MP and former Chief Minister Prem Kumar Dhumal will be the party’s chief ministerial candidate for the forthcoming Vidhan Sabha elections has sent mixed signals in political circles. The Banikhet assembly constituency had a record of having been the fortress of the Congress since Independence when there was territorial council in the Union Territory of Himachal Pradesh prior to the reorganisation of Punjab in November, 1966. The BJP has undertaken intricate caste-based permutations and combinations while allotting the party tickets to their leaders in the politically sensitive Kangra district to enhance its winning chances. Chief postmaster general, Himachal Pradesh postal circle, K.C.V. Nair, inaugurated the 7th National BSNL Kabbadi tournament in Kehloor sports complex today. Governor V.S. Kokje said today that a statewide survey should be conducted on child welfare so that their needs could be fulfilled adequatly. The body of Rohit (17), a resident of Naraingarh in Haryana, was found from a place near Kandaiwala village in Nahan tehsil today. The Congress virtually sprung a surprise when it rejected former parliamentary secretary and three-time winner Kashmir Singh Thakur as its candidate and decided to field Rajesh Dharmani, a youth Congress leader, as its candidate from the Ghumarwin constituency. Peveed at the denial of the Arki ticket to deputy speaker of HP Vidhan Sabha Dharam Pal Thakur by the central election committee of the Congress in favour of Prakash Karad, son of Padma Ram, who worked in the PMO’s hospitality department, Thakur’s supporters took out a protest march at Arki. Office-bearers of the Arki mandal resigned from their posts and raised slogans in protest. The Himachal Pradesh State Employees Confederation has rejected the appeal of State NGOs’ Federation president L.S. Machan that employees in the state should support the Congress in the Vidhan Sabha elections. Launching the BJP campaign in the Tissa rural area today, Mohan Lal, Chamba district unit president, claimed that the voters were in a mood to force a change in Himachal Pradesh. “Pawan Nayyar, Congress candidate from the Chamba assembly constituency, is not my son. I do not even have distant relationship with his family”, stated Sagar Chand Nayyar, a former education minister and veteran Congress leader, in a statement here today. He was reacting to a report captioned “Sons rise in Congress” published in these columns on November 26. The party leadership, which seemed in two minds whether to announce the party leader before the elections or not, came out of the dilemma today and asked Dhumal to lead the party in the forthcoming elections. Though Dhumal ran the last BJP government for full five years in the state, his election as the BJP MP from Hamirpur in the byelection had given some indications that he was being moved from the state to the central politics. The workers in the district are jubilant as they are now even more confident of sailing through easily under the glory of future CM from the region. After hearing the news, they assembled at Gandhi Chowk and raised slogans, exploded crackers and distributed sweets. There were reports of celebrations from elsewhere also. NAHAN: BJP workers of Sirmaur district have expressed happiness over the decision of the party high command to project Prem Kumar Dhumal as the chief ministerial candidate. A large number of party leaders from here welcomed the decision. According to them, “it was a right decision taken at the right time”. It would boost prospects of the party on all five seats in Sirmaur as it was a Rajput-dominated district, they said. In the absence of Shanta Kumar, it is Praveen Sharma who will be the party’s official nominee from Palampur, the hometown of the former union minister. Former minister in the Dhumal government, Praveen Sharma, has been denied the ticket from Chintpurni. The party has given the Chintpurni ticket to an advocate, Narender Sharma. Praveen Sharma had lost the elections by over 10,000 votes, which made the party rethink on fielding him. Former police officer A.N. Sharma, who was in the race for the BJP ticket from Nadaun in Hamirpur has been denied the ticket. It will be Vijay Agnihotri who will take on the Congress from Nadaun. A.N. Sharma, serving as a DIG, had resigned barely a fortnight back. Rajya Sabha MP and former state party chief, Suresh Bhardwaj, has been given the ticket from Shimla. Khushi Ram Balnatah, state party general secretary, who was keen to contest from Shimla, has been given the ticket once again from Rohru, where he faced Chief Minister Virbhadra Singh on two earlier occasions. The party has fielded former minister Mansa Ram from Karsog. 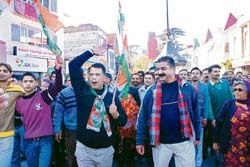 He had won the seat on the Himachal Vikas Congress ticket and had later joined the BJP. The party has decided to field Praveen Sharma from Mandi. With this the BJP has finalised the list of candidates for all 65 seats going to the polls during the second phase on December 19. Despite revolt by party men in about six seats, the central election committee did not review the list of 57 candidates announced earlier. Caring two hoots for the reports of secret agencies, including the CID, Intelligence Bureau as well as AICC’s own survey, the choice of Congress nominees for the Solan and Arki constituencies have proved that only top connections mattered, while popular criteria took a back seat. While a banner of revolt has already cropped up at Arki where deputy speaker Dharam Pal was denied a ticket and Prakash Karad, son of a former employee in the PMO, was favoured, the selection of Dr Kailash Parashar from Solan, too, had evoked a strong reaction from the Block Congress Committee (BCC). Parashar had managed to procure the ticket due to his proximity with the Union minister of state for external affairs, Anand Sharma, while he lacked any support from the BCC. None of the two figured anywhere in any report and yet had been given tickets, rued other aspirants. The Congressmen who were peeved at the ticket distribution said the party was inciting them to contest as rebels. What was interesting was the fact that even the disgruntled elements of the BJP owing allegiance to the Shanta camp had grouped together with the peeved Congressmen. Together they had floated a gramin mandal and are now preparing to field one candidate from Solan. The BJP activists had also lobbied hard for changing the ticket of BJP’s sitting MLA Dr Rajiv Bindal. Political observers opined that this new arrangement could upset the poll prospects of both the BJP as well as the Congress. The BCC was finalising a representation opposing the candidature of Parashar from Solan. This representation would soon be sent to AICC president Sonia Gandhi. Warning the party about a mass revolt in case there was no change of ticket, the Congressmen have sought an immediate consideration of their demand. They said that since the official nominee lacked any public support and had rather worked anti-party on many occasions like formation of the Municipal Committee, his candidature was not acceptable to them. Even an attempt to contest a ward election by his wife had ended in an embarrassing defeat for the party, pointed out BCC office-bearers. Kicking off the campaign for his son Anil Sharma, former Rajya Sabha MP and Congress nominee from Mandi Sadar, Sukh Ram said that “struggle and conspiracy” had been “two main companions” in his 46-year-long political career, which threw up “challenges” for him. Sukh Ram dedicated his “telecom revolution” to former Prime Minister late Rajiv Gandhi stating that he had a vision for a “modern India”. Regarding his pending court cases, he said he was a victim of conspiracy, but added that he would come out clean of it. Talking about his son, he said: “It was senior Congress leader Sushil Kumar Shinde, who drew my son into politics. Do you make money or property for your neighbour. Anil is his true successor and he expects that he will fulfil his dream projects. He can do so only if he gets a berth in the next government”, he added. He urged Chief Minister Virbhadra Singh to take benefit of his telecom revolution in the current election as the BJP had made no contribution in this sector. The BJP could claim their part in other sectors of development in the state but it had made no contribution in developing the telecom sector, he claimed. Sukh Ram said the state faced two major challenges which were unemployment and burgeoning debt problem. “I will campaign for the Congress and ensure that it forms the next government. I have only quitted electoral politics but will continue to serve the Congress till my last breath ”, he declared. Addressing a press conference here today she said the final list had been approved after taking all factors into view and the party had taken care of all sections of society while allotting the ticket. There were a number of aspirants for the ticket from every segment but only one person could be accommodated. It was natural for some of those denied the ticket to get disappointed but they were all loyal party men and eventually support the official candidate. She said the party had not favoured kin of senior leaders. All those who had been given the ticket belonged to political families that had been in the thick of politics for years. She claimed the party would return to power on the basis of its achievements. The decision of the Centre to set up an IIT and a central university in the state would certainly benefit the Congress. Further, the implementation of the national rural employment guarantee programme had created a huge impact in the rural areas as people were getting employment at their doorstep. Regarding her opposition to the grant of the ticket to the associate members who had won the last elections as rebels she said it was her personal view. The party as a whole had decided to give the ticket to four of them and she had no complaints. Regarding the decision to field Prakash Chand Karad, a Scheduled Caste from Arki, a general seat, she said that it only showed the party’s courage and commitment towards the underprivileged sections. The following is the list: Rampur- Brij Lal (BJP), Chopal-Dhanvir (Ind), Kumarsain -Bhagat Ram (BJP), Theog-Rajinder Singh(Congress) and Joginder Singh(Congress) ,Shimla - Harbhajan Singh(Congress). Hamirpur: Congress candidate Anita Verma and one Independent candidate Brij Lal filed their nominations for the Hamirpur Assembly constituency today. 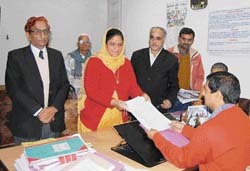 Congress MLA from Shimla Harbhajan Singh Bhajji and Congress candidate Anita Verma file their nomination papers from Shimla and Hamirpur, respectively, on Monday. After filing her nomination, Anita addressed Congress workers at Gandhi Chowk. She said she was hopeful that people would support her this time. She detailed out various development works undertaken during the present Congress government in the district. District Congress president Balak Ram and general secretary Anil Verma were also present on the occasion. MANDI: Three candidates, sitting Congress MLA Teg Chand Dogra from Nachan (SC reserved), former PWD minister and BJP candidate Mohinder Singh Thakur from Dharampur and sitting Congress MLA Surinderpal Singh from Jogindernagar, filed their nominations today. Mohinder Singh Thakur, who filed his papers at the office of the SDM, Sarkaghat, held a rally thereafter and kicked off his campaign. 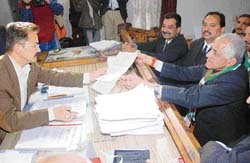 Kullu: Two candidates, including BJP district president, Khimi Ram, filed their nomination papers today. Ramesh Chand has filed his nomination paper as the CPM nominee for the Anni Assembly constituency, while Khimi Ram filed his papers at Kullu for the Banjar Assembly constituency as BJP’s official candidate. Former education minister of the BJP, Karan Singh, has officially joined the BSP and announced that he would file his nomination papers from the Banjar Assembly constituency as the official candidate of the BSP on November 29. Party’s ranks and file feels the party will gain against the Congress in the central Mandi and Shimla apple-belt. However, the party will be put on the defensive on the corruption issue as the Congress has ready-made issue of “hard disk bomb” against the then Dhumal-led government. The “hard disc bomb”, as per Virbhadra Singh’s recent statement, contains the deleted data retrieved by the government that contains names of over 3,015 candidates for jobs. The list was allegedly prepared at the instance of the then CM Prem Kumar Dhumal. Dhumal had dismissed the charge as a “political gimmick” to defame him at several press conferences. In contrast, Shanta Kumar is considered to be a “hard taskmaster, unbending and disciplinarian” who had irked employees and apple growers while he was the Chief Minister. Though the BJP expects to lose the edge in the Kangra belt by sidelining Shanta Kumar, who represents the Brahmin lobby in the party, the party expects much more gain by projecting Dhumal, who represents the majority Rajput lobby as its leader, not only in the Hamirpur-Una-Bilaspur belt, which has 14 seats, but also in the Mandi-Kullu-Shimla apple belt which has 21 seats, strategists say. Party president Jai Ram Thakur said parliamentary board’s decision on the leadership issue was non-negotiable. The meeting it was attended by senior leaders Atal Bihari Vajpayee, L.K. Advani and Rajnath Singh and all pros and cons were weighed. “Both leaders will campaign for the party, but the party will go to the polls under the leadership of Prem Kumar Dhumal. Dhumal will contest from Bamsan and Praveen Sharma from Palampur. Shanta Kumar will not contest, but he will play his role at the centre as the board has decided”. The Congress has captured the seat of the constituency seven times since 1967. The constituency had been the stronghold of late Des Raj Mahajan, father of Harsh Mahajan (presently the cabinet minister) since 1972, who was defeated by Gian Chand Dhawan, a candidate of the joint front formed by the opposition parties called the Janta Party in 1977. At that time, Jan Sangh (now the BJP) merged into the Janata Party. Later on again, Des Raj Mahajan captured this seat in 1982 assembly elections. The newly formed BJP won this seat twice; once in the 1983 mid-term assembly elections by late Kishori Lal, former minister, after the death of Des Raj Mahajan, the then cabinet minister. Asha Kumari, the present MLA, and former minister won the elections from Banikhet in 1985 assembly poll for the first time. In 1990, when there was ‘a BJP wave’, Gandharv Singh defeated Asha Kumari of the Congress. Now Asha Kumari is going to contest the assembly elections for the sixth time. During this election too, Asha Kumari of the Congress is fighting her battle against old rival Renu Chadha of the BJP. But this time, the BSP is expected to field its candidate having stronghold in the area, which can eat into the vote-bank of either the Congress or the BJP candidate, thereby spoiling their winning chances. The total voters, including service voters, in this constituency are 78,251. Out of the total of 16 assembly seats, the candidates had been announced for as many as 15 seats. It has kept the suspense on Palampur constituency from where the party high command is double minded whether to field former chief minister Shanta Kumar or not. Though short of its promise to implement 33 per cent reservation for women the BJP has fielded three women candidates from this district in a bid to attract women voters that are slightly higher in number in the district. Women candidates Malvika Pathania is a Rajput, Sarveen Chaudhary from Shahpur is from other backward classes and Anita Dhiman from Gangath is from scheduled caste. It appears that a balance has been made among the women candidates by the BJP here. There are a total of 10,78,888 voters in the district out of which there are 5,39,792 women and 5,39,096 men voters. As far as caste combinations are concerned, the BJP has fielded four candidates Vidhya Sagar from Kangra, Ramesh Dhawala from Jawalamukhi, Sarveen Chaudhary from Shahpur and Mangal Chaudhary from Nagrota Bagwan from the other backward classes, which are a dominating factor in these constituencies. Five Rajput candidates Vipin Parmar from Sullah, Ravinder Ravi from Thural, Harbans Rana from Guler, Vikram Thakur from Jaswan and Malvika Pathania from Nurpur have been given party ticket to strike a balance in the another dominating class. The party has fielded three scheduled castes only on the three reserved constituencies; Anita Dhiman from Gangath, Captain Atma Ram from Rajgir and Naveen Dhiman from Paragpur. Interestingly, the BJP has also fielded two scheduled tribe ‘Gaddi’ candidates Dulo Ram from Baijnath and Kishan Kapoor from Dharamsala even as the total population of the STs is less than one per cent in the district. It may be that the party high command has taken into consideration the probability of ‘winning abilities’ of these candidates, while allotting tickets to them. So far, only one Brahmin (pandit) Rajan Sushant has been fielded from Jawali constituency. The candidate for the Palampur constituency is yet to be announced. If Shanta Kumar is fielded from this constituency there will be two pandits fighting on the BJP ticket in the district. Overall, the BJP seems to have done a possible fine balancing act to give representations to different castes but it has overlooked the presence of the Mahajans (banias) in the district. There are two sitting MLAs of the Congress Sat Mahajan from Nurpur and Brij Bihari Butail from Palampur belonging to this community. Ignoring this community that has its presence in the district may cost the BJP a couple of seats, feel political observers. Nair said BSNL had brought a communication revolution which was helping people throughout the country. He said BSNL was organising cultural programs and sports competitions with a view to promote understanding and brotherhood between people of various states. Himachal telecom circle chief general manager Anil Kaushal said it was for the first time that 27 teams, including four teams of women from different telecom circles of the country were participating in the five-day tournament. He said teams from Haryana, J&K, Gujarat, UP, MP, Tamil Nadu, Karnataka, Bihar, Delhi, AP, Rajasthan, Punjab, Maharashtra, MTNL Delhi, Kerala, MTNL Mumbai, Jharkhand, West Bengal, Chattisgarh and Himachal Pradesh would participate in the event. In the primary matches conducted today in the mens category, HP defeated Jharkhand (70-6), Rajasthan defeated Punjab (53-46), UP East defeated Gujarat (17-4), Haryana defeated J&K (32-20), Karnataka defeated NTR Delhi (69-15), Tamil Nadu defeated Bihar (44-13), Maharashtra defeated UP West (28-7), MTNL Mumbai defeated West Bengal (34-26), J&K defeated MP (27-9), AP defeated Bihar (34-4) and Kerala defeated Chattisgarh (32-4). Kokje today released the Himachal Pradesh Voluntary Health Association’s (HPVHA) publication, including an analysis report on budget for children in Himachal. “If a survey is undertaken to identify the needs of children the budget allocations can be made accordingly,” he said. Kokje said there must be a social audit for all these welfare activities. A survey must also be undertaken to identify the exact number and needs of special children. “With proper statistics an effort can be made to accommodate these children in various schools with emphasis on inclusive education,” he said. ASP Sirmaur Bindu Rani Sachdeva told The Tribune that Rohit had been missing since November 21 and a case of kidnapping was registered at the Naraingarh police station. She said the Naraingarh police had rounded up some persons who during interrogation confessed to have murdered Rohit after kidnapping him. The murder mystery was solved with the assistance of the Sirmaur police and the Naraingarh police. This has put both the BJP and the BSP in a tight spot as both the parties had set their calculations considering Kashmir Singh Thakur as the Congress candidate. This declaration has upset estimates of the BJP which had decided in favour of its old candidate and sitting MLA Karam Dev Dharmani who had defeated Congress candidate Kashmir Singh Thakur by a margin of 3,407 votes in the 2003 Vidhan Sabha elections. While Rajesh Dharmani’s group is elated over his candidature, supporters of Kashmir Singh Thakur are feeling dejected. Now a tough battle is expected in this constituency between both the Dharmanis- Rajesh of the Congress and Karam Dev of the BJP . Thakur, who has been a winner on three successive occasions, failed to get the ticket despite his name figuring solely in the PCC list. Initially, four candidates had applied for the ticket. All pleas made by Thakur before party in charge R.K. Dhawan fell on deaf ears. Mohan Lal claimed that the BJP would sweep the polls and form a government in the state. He stated that the Congress had failed to harness the natural resources like river waters, medicinal herbs etc available free of cost in the state. “ The Congress government has failed to provide roof to about 24475 families living in the open in the state,” Mohan Lal said.